Mickey's Very Merry Christmas Time! 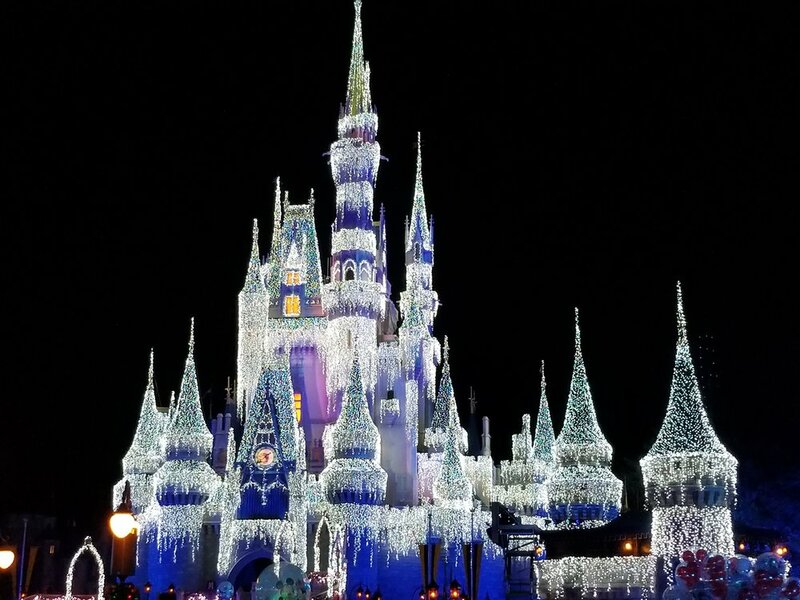 Disclosure: I was invited to Disney's Magic Kingdom to experience the holiday magic of this annual festivity. All thoughts, opinions and annual passes are purely my own. Just as Halloween begins when Mickey says, in this house, the holiday festivities begin when the Mouse invites us over for some hot cocoa and snickerdoodle cookies, showers us with fake snow, wows us with the lights on the castle and asks us to settle in to all things merry and bright. Yes, it's time for Mickey's Very Merry Christmas Party. This year, I got to thinking...what else can I do there? What else can I tell you about? I mean, everyone knows that Santa takes time off during the holidays to visit Mickey and his friends. And it's common knowledge that all the action happens center stage at the castle with singing and dancing to your heart's content. But...what else? Complimentary Holiday Treats? I ate all the cookies before I could check this off the list! As I was reminiscing on holidays past, it hit me! PICTURES! Raise your hands if you keep meaning to take pictures in order to send out Christmas cards? It has been like 3 years at least. And every year I feel bad. This year, I wanted to slap myself for not thinking about this earlier. YOU GUISE! I'm already going to the perfect place with all the decorations one could possibly want AND PHOTOGRAPHERS! What was I thinking?! Now, I could've gone all out with fantabulous Christmas gear but I wanted it to be fun as well. If you have time and can get your life wardrobe together then, you might even be able to change clothes and take more pictures! Now, I SWEAR by my Memory Maker. Honestly, I don't know how anyone goes to the parks and doesn't get one. It's the perfect way to sit back, enjoy the parks without lugging around a huge camera, and still capture the memories. I've told you about this before so don't act like you just heard about it. So, I now have a handful of cute pictures to choose from (along with some holiday ears and lights that we found along the way!). Finding the hot spots are easy! Be sure to walk through the right-side entry once you step into the Magic Kingdom. Cast members will lead the way. You will notice photographers ready and willing to snap a picture of you and your family. Be sure to pick up your event map at the entrance to find out where the treats and cool spots can be found (along with fireworks and performance times). Not only were we able to capture our joy but, we ran into Brittany from Clumps of Mascara and Ms. Elle from Little Brown Gymnast and it was just the cutest thing EVAH! By the end of the night, the Frog Princess told me "see, Mami! Now I have a little sister and you didn't even have to do work for it!" I mean is this place magic, or what?! Are you planning on heading to Mickey's Very Merry Christmas Party? Be sure to check out the site for available dates! See you at the parks!